Here’s how many people, if they are not in denial about it, view the current environmental crisis: global warming has begun, weather will become more extreme, and the changes in temperature will impact agriculture, the habitability of sea coasts, and the survival of some species. The last item—species extinction—sits like an afterthought in such a summary. The description minimizes the prospect that we are probably entering the sixth of the planet’s massive extinctions. 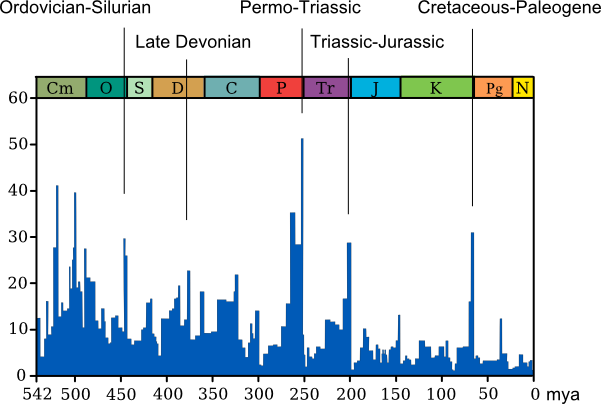 The first five mass extinctions took place over the last half billion years as the results of sustained volcanic eruptions, large meteors, and ice ages. They lasted for millions of years. Today, though, in the popular imagination, they seem like little more than fantastical events far in our past that are pictured occasionally in magazines and science fiction movies. The current mass extinction is man-made. Called the Holocene extinction for the present geological epoch that began in 10,000 BC, it results from the steady increase in human numbers and, in modern times, from global warming, environmental destruction (rain forests, for example), overfishing, pollution, and the movement of invasive species and diseases around the world. It seems likely that each of these plagues is just getting warmed up. The first five mass extinctions. 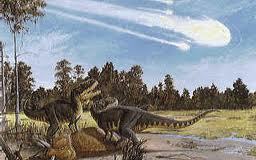 The dinosaurs came into their own after the Triassic-Jurassic extinction and went out with the Cretaceous-Paleogene one. The severity of the current, sixth, extinction is debated. According to Wikipedia, estimates run between 100 and 1000 times greater than the normal extinction rate. Ten years ago, E.O. Wilson famously predicted the loss of half of the current species 100 years from now. The exact rate aside, the losses have already cut across the organic spectrum. Amphibians, including frogs and toads; bird populations; fish species; invertebrates, mostly insects; plant species—all have declined. Mammals are vulnerable because they are dependent on plants and other animals down the food chain. In part because humans live almost everywhere on the globe, our species is not likely to be pressed to extinction anytime soon. But we can’t know the long-term impact of the next several decades’ addition of billions more humans and their demands for water, minerals, meat, and cars. No matter whether the current extinction turns out to be a major one or only a middling one, its severity will earn it a place among the turning points for life on the planet. The chain of earthly life that is billions of years long has been tested in the past by meteors and volcanoes. It’s painful to think that it will be tested this time by one of its own. This entry was posted in Dying, Surviving and thriving and tagged dinosaurs, extinction, global warming, mass extinction, meteors, pollution. Bookmark the permalink.